This certified organic eye contour cream provides complete care for the eye contour, fighting wrinkles, dark circles and pouches. Capacity : 20 ml. Airless bottle to preserve the effectiveness of the active ingredients. 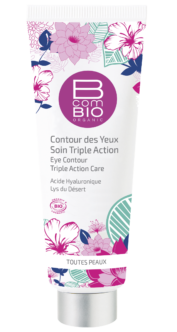 Apply Eye Contour Triple Action Care morning and night to the eye contour area using gentle dabs. External use. Water, Organic blueberry water*,Plant oil**, Organic cornflower water*, Emulsifier**, Glycerine**, Organic hazelnut oil*, Organic green tea extract*, Organic marshmallow extract*, Hibiscus seed extract**, Blend of essential oils**, Thickening agent**, Gelling agents**, Mineral powders, Preservatives, Vitamin E**, Sunflower oil**, Acidifier, Fragrance**. 98.5% of the total ingredients are natural or of natural origin. 98.9% of the total plant ingredients are from organic farming. 30.4% of the total ingredients are from organic farming. Apply Eye Contour Care before your moisturising or anti-age care. To activate the micro-circulation, use the fingertips to tap lightly from the inner corner to the outer corner of the lower lid.